In 1976, an Air France flight out of Tel Aviv is taken over by two Palestinians and two German terrorists, Brigitte Kuhlmann (Rosamund Pike) and Wilfried Böse (Daniel Brühl), who are sympathetic to the Palestinian cause. 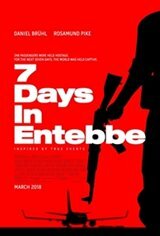 They force the pilots to land the plane in Entebbe, Uganda, where the 239 passengers — including 84 Israelis and the Air France crew — are taken hostage. The terrorists demand a ransom of $5 million and the release of 50 imprisoned pro-Palestinian militants, 40 of whom are in Israel. They threaten to kill two children every 24 hours if their demands are not met. However, Israeli Prime Minister Yitzhak Rabin (Lior Ashkenazi) and Defense Minister Shimon Peres (Eddie Marsan) refuse to negotiate with terrorists. Peres instead gives the go-ahead for a covert rescue mission known as Operation Thunderbolt.